A group of people play "charades" in sign language. This film pays homage to the transition that occurred in the cinema around 1926 as sound film took over and silent film began its decline. The silent cinema "spoke" body language, a universal language. Sound cinema requires the use of codified languages. 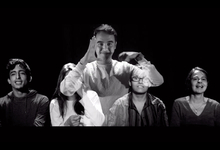 Here, charades is played by a group who speak sign language. The audience watching the film is forced to slip between a language they understand and one that they do not.